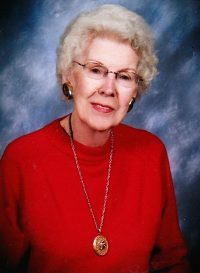 Mary Elizabeth Patti – (92) – formerly of Church St., Hornell, died Monday afternoon (April 8, 2019) at Elderwood of Hornell Nursing Facility where she had resided for the past 2 ½ years. The family of Mary Elizabeth Patti will receive friends on Monday from 3:00 PM – 5:00 PM at the Dagon Funeral Home, 38 Church St., Hornell, NY. A Mass of Christian Burial will be celebrated on Tuesday at10:00 AM at St. Ann’s Church with burial in St. Ann’s Cemetery. I loved Mary Patti. I enjoyed going to her home and having her show me her latest work of art-a quilt, an armchair cover, a cover for scissors, sewing machine, or whatever-they were all unique. She gave me a quilt holder, which she asked me to fill up, and I did. I also loved visiting with her. She was a wonderful person. she told me that she loved her new home because other that the good treatment she received, there were other ladies who also liked to sew, and they had a sort of “sewing circle” up there. She simply loved it. God bless her, and I am sure He is doing so, as we speak. I am also sorry that I can’t make it to her services this week.